The credits roll to the accompaniment of tense music as the camera tracks fluidly through hallway of an ancient house and stops at the foot of a staircase as a young lady descends it. A jolting cut to the lady (Isla Crane)’s face occurs, before another cut takes us to her point of view as we see a large menacing shadow on the wall upstairs. The camera then cuts back to her (effectively a shot-reverse-shot) in a high angle that conveys threat and oppression. She screams. 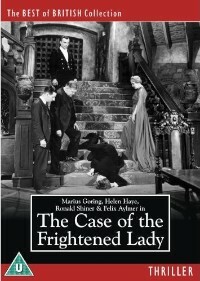 Thus begins The Case of the Frightened Lady, another in the series of forgotten British ‘B’ movies released by Odeon Entertainment. This particular title carries quite a pedigree- it was adapted from a play by none other than Edgar Wallace, its Assistant Director is Hal Mason- whose illustrious c.v as Production Manager spanned 1942-1959 and encompassed virtually every famous British film in the process, and the film stars such solid acting talent as Marius Goring, Helen Haye, Ronald Shiner and Felix Aylmer. The director- George King- is perhaps less well known despite over a quarter of a century of directing credit. The plot of The Case of the Frightened Lady is a seemingly straightforward one, be it with the familiar complications that prevent the film ending in the first ten minutes, but a surprising twist (genuinely unforeseen!) ensures it holds the interest. In many respects, its limited public exposure (it has never been shown on television) is surprising (it would make a perfectly acceptable afternoon film) yet it seems oddly anachronistic. Released in 1940 when the country had other things on its mind than a romantically Gothic thriller, the film has the visual style of an early 1930s film- if this were made in Hollywood by Universal in 1933 one would be now referring to it as a classic accompaniment to the other cycle of films made by that studio in the first years of the Thirties. One of the other blessings is that the film (at 82 minutes) does not outstay its welcome, and The Case of the Frightened Lady is a welcome addition to a very fine series- ‘The Best of British’- which showcases forgotten films from a golden age in British cinema.